Some of you may recognize this owl. I made her back in 2010, but didn’t make a YouTube video of the extended tutorial. A few days ago, one of my YouTube subscribers asked if I’d ever made an owl. It reminded me that a lot of people probably never saw the original article. You can use my pattern if you want, or make your own. I used a grid to transfer the pattern to a large piece of cardboard (the original snowy owl was about 24 inches tall). To make an owl that size, you would use a grid with 2″ squares. If you want a smaller one, just make the squares smaller. 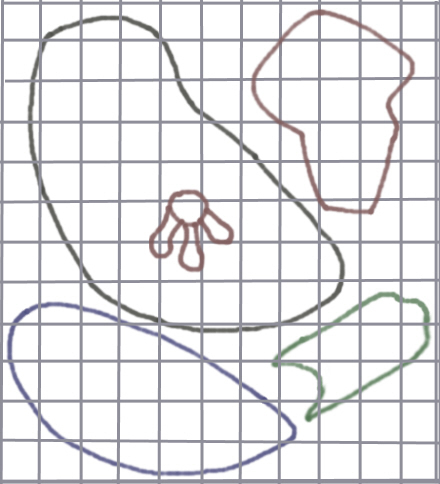 Or use a tracer/projector to enlarge the pattern, and skip the business with the grid. And don’t forget about our new forum! I have just considered using Paper Mache as my medium for a fox sized dragon puppet of some sort. Its just an idea but I was wondering about a few things. I have NEVER worked with paper mache before so I have a few basic questions. 1. Why is an armature so mandatory when working with paper mache clay? I am very used to working with Polymer clay and Air dry clay, neither of which need such a complex armature (at most a ball of tin foil, but that was just to save some clay ;)). 2. What are the benefits of working with Paper ache clay vs Polymer, Air dry , or Apoxie clays etc.? 3. What are Blue Shop towels used for? The paper mache is not the same consistency of real clay or Polymer clay. It’s intended to replace the paper strips and paste used in traditional paper mache work, which is almost always done over an armature. The mixture won’t hold up on its own. A ball of tin foil will work just fine as an armature, and you can add additional paper mache clay over the first layer, to build up details. The biggest benefit of using the paper mache recipe is simply that most of us can afford it. Even a very large sculpture costs a fraction of the amount it would cost to use a commercial product. All the products you mentioned are great. But some of us like to build bigger things, and we don’t have a lot of money to spare. I can’t remember using the blue shop towels for the owl. Did I? It’s been awhile. I use them a lot when I make masks, because they’re very strong and light, and they stretch a little, so it’s easier to use larger pieces of paper. You can see me using them in this video. Lately I’ve been making the shop towel paste with joint compound and glue, but the end result is the same as shown in the video. Thanks for the advice Jonni! I just really don’t think I have the patience to construct a nice, realistic armature for my projects. So I think I will just use a ball of tin foil and a bit of masking tape where needed. Yeah my question was, what are shop towels used for. I don’t have any experience with paper mache and was confused as to why you used Blue Shop towels over the paper mache clay (like in your Raccoon video). Also is plaster cloth used just to make molds for simple originals? I think you can use plaster cloth that way. I often use it when I’m in too much of a hurry for paper mache to dry, or if I want to use a balloon for an armature without all the shrinking or wrinkling that happens when you put paper mache over balloons. So ,just to confirm, blue shop towels are used to cover the paper mache surface, making a dry surface, even though the clay is still wet. So, just to confirm, be shop towels are used as a dry surface over wet paper mache that way your can go ahead and paint it even though the mache still hasn’t dried. Would the sculpture be fine without the shop towels? What would the sculpture lack without the towels? No, that’s not at all what they’re used for. Why don’t you tell us what you’re trying to make, and I’ll try to give you some specific advice. One thing you really can’t do is paint a sculpture before it’s dry all the way through. The shop towels are just an alternative form of paper, instead of newspaper, if you’re making a sculpture with paper strips and paste. The head (that has a hinged jaw) and paws would be made out of Paper ache. I might use a bit of paper mache for the frame, however most of the frame should be wire. Then the frame will be covered with fas fur (like a posable art doll). It seems like paper ache is really light so that will aid the operation of the puppet. Thanks for the tutorial. I have begun working on a raven, and this comes just in the nick of time to help me with that. I had put on the wings and am trying to figure out the tail, but with this tutorial I realized I need to do the tail first and wings second. One never knows what one is going to learn. I saw a Nature program last week on Snowy Owls. It was fascinating about their rugged existence and their strength. 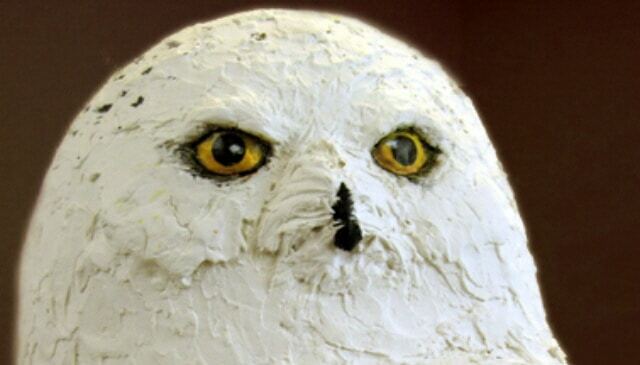 Your snowy owl is beautiful. (And their eyes are very yellow!) Thanks. 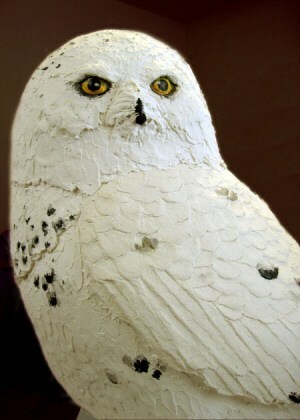 Rex, I read an article just the other day about snowy owls. They’re coming farther south this winter, and they’re trying to get people to stay away from them. Not because the owls are dangerous, but because the extra effort of having to fly away from a human could take all the reserve energy they have left after a long flight, and it could kill them. I’d love to see one, though. From a distance, of course. The use of the raw hand pressed looking paper over the base gives it such a nice look, not exactly realism but a sophistication that a lot of painted varnished paper mache doesn’t usually have. It really is lovely.